Sale time. Looking for some discount designer wedding outfits? Its the wedding season and no matter how many outfits you might have calculated to buy, the number always exceeds. The worst part – budget always remains the constraint. So in case, you are looking to score some awesome ethnic wear at a heavy discount, then this post might just make you smile a bit. SHYAM NARAYAN PRASAD LEHENGAS ARE ON 70% OFF ! Ok, to be honest I don’t know much about Shyam Narayan Prasad. I came across the name for the first time. But, his designs are pretty fantastic. Perfect discount designer wedding outfits. 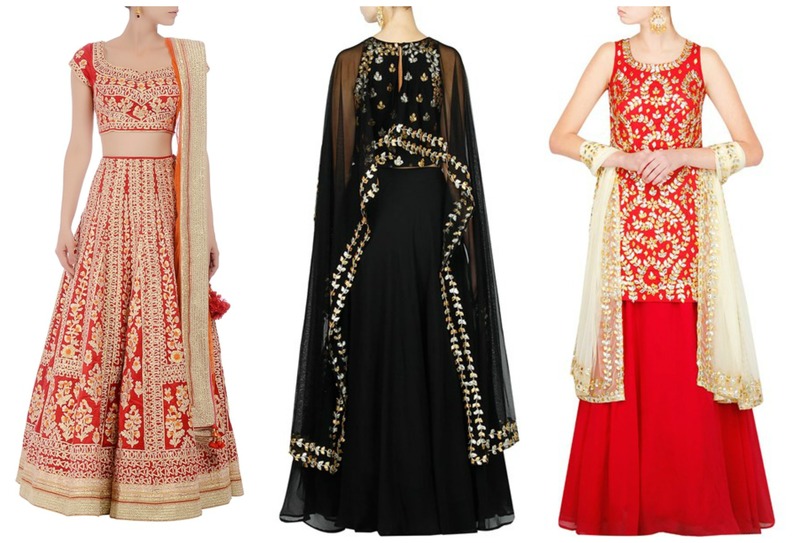 Some serious contenders for the budget wedding lehenga. What say? ABHINAV MISHRA LEHENGAS ARE UPTO 40% OFF ! I recently visited his store in Shahpur Jat, and oh my gosh the boutique is so pretty. Its all because of his outfits, there are so so dream like. Guaranteed, you can’t pick your favorite. They are all so good. To be honest, designer wear is scary when it comes to price…but if you do get something in a good deal, its worth stocking up on these beauties. Buying a Abhinav Mishra discount designer wedding outfits is fantastic. You can even get away with a pretty bridal piece on discount if you really look for one.